It's easy to get lost in Venice. In fact, getting lost is part of the fun, since the city is small enough that you're bound to encounter a familiar landmark before panic or exhaustion sets in. Still, a good map can save wear and tear on your Birkenstocks, and it's a good idea to buy one before you search for your hotel. Some of our favorite maps are shown below; look for them at any bookstore or well-stocked newsstand in Venice. Don't rely on free maps or cheap pocket-size maps with little detail. Such maps may be useful for giving you an overview of where you are or where you're headed, but they'll leave you frustrated when you get lost and can't find your destination. Read our article on Walking in Venice for advice on finding your way around the city with directional signs, street signs, and maps. This large folding map is exceptionally easy to read, thanks to its subtle color scheme, uncluttered layout, and clear type. 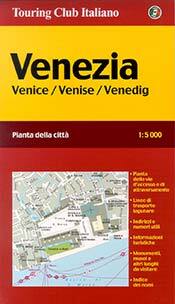 The TCI 1:5000 map covers all of central Venice. 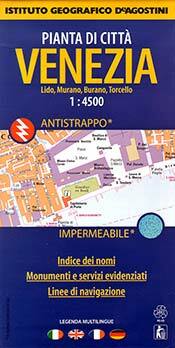 It's accompanied by 1:10000 maps of the Lido, Murano, Burano and Torcello, the cemetery island of San Michele, and and major highways on the mainland. All maps are on the front of the sheet, with a street index printed on the reverse side. When it's drizzling, you'll appreciate this map's waterproof material and coating. It feels like a slightly limp paper map but resists both water and static electricity. The map itself is nearly as good as TCI's (see above), but it doesn't seem to have quite as many street names. Unlike the TCI map, it's split into two parts, with part of the map and index on the front and the rest on the back. With 50 pages of highly legible grid maps and a 20-page index, this street atlas is a perfect companion for your tote bag or purse. The compact, spiral-bound book also includes a regional highway map, a legend, and a color map of the lagoon's public transport system.It's no longer in print, but if you're lucky, you'll find one at a secondhand bookseller or on eBay--as we've done two different times. At US $7.95, this American map is overpriced in terms of its cartographic content, but its small size, sturdiness, and plastic coating make it a handy all-weather pocket map for travelers whose eyes or bicocals can handle the minuscule type. Streetwise Venice cuts a few corners (more specifically, Giudecca and most of Cannaregio) in the interests of small dimensions. However, it does manage to squeeze in an index of major campi, streets, and tourist attractions. And on a day when it's raining cani e gatti, there's nothing better. These regional tourist and nautical maps cover the immediate area around Venice, with #5 reaching inland to Treviso and #6 extending south to take in the isthmus road to Chioggia. Either map will help you get into the city by car without getting lost, and both will help you stay within the navigation channels if you're intrepid enough to rent a boat and explore the lagoon.